The draw provided us with many interesting scenarios and we saw that last year Georgia won all four medals at -60kg while this year that went down to two. 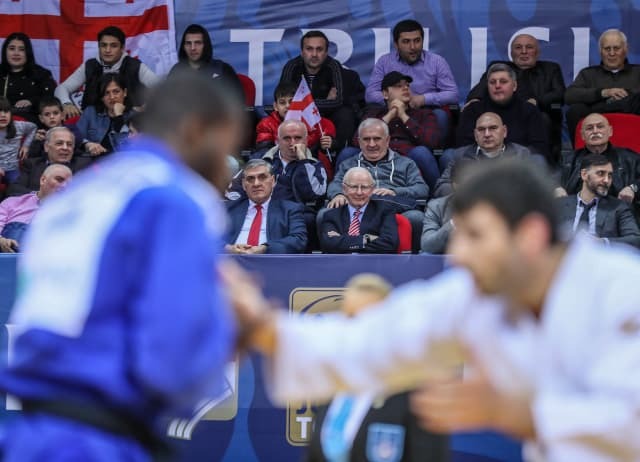 Judo for men in Georgia is so important and that's shown by the fact that they won 10 medals here. This is in contract to their women's team who failed to medal but have a lot of promise. The last day, in context with other two days, show for women's judo the big component that is France and Kosovo with their two gold medals demonstrated their capcity from a small country which is very different to the big system in France. Everything is possible in judo. We can take into consideration that we have two Grand Prix events in a row and some countries have different strategies for men and womens team's. From a technical point, the judogi rules were implemented well, almost every judoka has started to tidy their gi on their own, atheltes have the same chance as a result with the jacket tucked into the belt. Of course with a few execptions but it's still in process and we are learning from it. Judogi is important for you but more important for you opponent, it's part of our etiquette to give equal opporunity to your opponent. We saw a dynamic weekend of judo, with young names and in terms of techniques we saw a lot of uchi-mata-sukashi and a lot of o-soto-makikomi from Georgia and from other nations. The transtions from tachi to ne-waz contineu to improve not just when tori was throwing, but when atheltes threw and others took advantage as there was no break. Sometimes we don't know score, but athletes are prepared to continue and utilise strong kumi-kata. Yoko-shiho-gatame and juji gatame were both popular in ne-waza. I'd like to point out in the first two days the team of india, today was more difficult, but overall they showed a fantastic spirit, good techniques and a strong squad. To win -48kg, France's Melanie CLEMENT did not stop working, she gave 110%, and that showed what you have to do to win against the world champion. The head-to-head rivalries in many countries are becoming interesting in the race for Tokyo 2020. Some countries saw double medallsits in the same category and that means they are taking the qualification very seriously and giving the same opportunities to their judoka. Daniel Florin Lascau won the World Championships for Germany in 1991. In addition to being an IJF Sport Director, Lascau is a key member of the IJF Academy and also serves as a Referee Supervisor for the IJF.